Several online numismatic coin forums have been abuzz lately with people new to the hobby, often wondering if the interesting coin they discovered in their change is valuable. Many of these are young people, often mesmerized by a run-of-the-mill cent from the time I was born. Though only slightly over forty years of age, from their perspective this coin represents something from Europe’s Dark Ages. Like many of us more experienced collectors they begin to take an interest in the history of the coin, or the time from which it came. Unfortunately, all too often one of our fellow hobbyists, masked by the anonymity of the internet, replies to the inquisitive would-be numismatist in a condescending tone, deriding them for not knowing the basics of the hobby. More often than not, the would-be numismatist responds as one would expect: their interest dies, and they go on to pursue other things. This author intends to combat that phenomenon, and introduce new collectors to the basics. More experienced readers may benefit from a refresher, as well. Whatever the reason someone becomes interested in coin collecting, there are some fundamentals any collector should understand. The first is to become educated, and there are multiple avenues in which to do so. 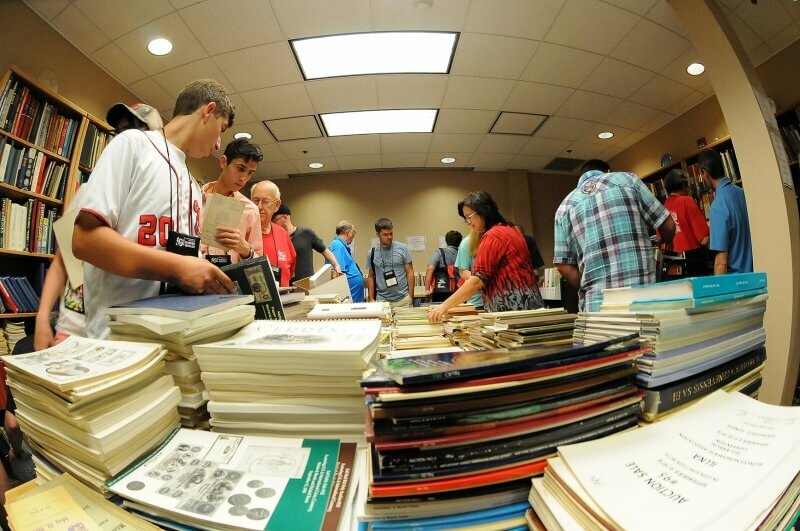 The oft-repeated phrase in the hobby is, ”buy the book before the coin,” and it is probably the best advice any collector will receive. In fact, if a new collector told me they had $20 in their coin budget and asked what they should buy with it, I would point them to a book rather than a coin. The first numismatic book any collector should read is on grading. Grading is the descriptive term we use to show how worn the coin is from regular use. The higher the grade, the more one can expect to pay for the coin. All US coins today are graded on a 70 point scale ranging from Poor-l through Mint State-70, with multiple descriptive steps in between (see inset). The scale was first invented by Dr. William Sheldon for early copper large cents,1 but has since been expanded to everything in the U.S. and other places. The most popular grading books are Official American Numismatic Association Grading Standards for United States Coins,2 Grading Coins by Photographs,3 and Photograde: Official Photographic Grading Guide for United States Coins.4 This author owns all three and references them regularly! Grading is both an art and a science, and, like any skill, it takes the knowledge provided through reading and mentorship combined with practice to become good at it. It is, however, perhaps the most important skill a coin collector can master. Therefore, after reading at least one of the aforementioned books, a numismatist should seek one of the following ways to increase their skill. The most readily available method is to take the American Numismatic Association’s correspondence course entitled, “Grading U.S. Coins Today.” Members and non-members can take the course; contact the education department for details (719-482-9829, education@money.org). Perhaps the best method to enhance one’s grading skills is by attending the ANA’s Summer Seminar. Held every year at the ANA’s headquarters in Colorado Springs, fellow numismatists can opt to take one of any number of seminars offered over the course of five days. Grading United States Coins (parts 1 and 2) are almost always offered, as are more advanced grading seminars, specialty seminars, and even mini-seminars offered over two evenings. The grading seminars tend to be the most popular because of their foundational skill in the hobby. Many collectors opt to specialize rather than gobble up anything they find interesting, and reading books on their specialty is the best way to do it. I once met a collector who buys nothing but large cents from 1794. I’ve met others who pursue date and mint mark sets of one coin series, such as Mercury dimes, Franklin halves, or Lincoln cents. Each of these coin series and others have a plethora of books from which to choose, so a new collector should select something that interests them and then read at least one book on it. A wise coin collector will learn as much as they can about one series before they begin to collect it. What rare or expensive coins will prohibit a collector from completing a set? What varieties are available and how difficult are they to find? What is the collector’s objective (date and mint mark set, type set, year set, only key coins, etc)? Once these questions are answered and the collector has a direction to pursue their hobby, there is one more thing he or she needs before plunking down cash on their favorite coins: Every collector needs a loupe. A loupe allows one to see the coin’s surfaces, typically magnified 5X, 7X, or 10X in numismatic circles. Authenticating a coin’s genuineness by looking at specific points you learned about while reading is one main use of a loupe, as are grading, examining toning to determine whether it is natural or artificial, checking for signs of cleaning or other damage, and attributing varieties. Therefore, after a new collector has spent their coin budget on a book, the second thing they should save for is a loupe. A good one is usually under $50. Armed with a book and a loupe, a new collector is now ready to begin putting that hard-earned cash into some coins! 1. For coins not inside any kind of holder, referred to as ”raw” coins, only hold it by the edges. Oils from fingers left on the coin’s surfaces can damage it over time. Some people use specially made coin tweezers or white gloves rather than holding the coin with bare fingers at all. 2. When you spot a coin in which you are interested, examine it under good lighting. Look at the luster, or shininess of the coin, to determine whether the coin has been harshly dipped, cleaned, whizzed, or otherwise damaged. Check for hairlines, or tiny scratches parallel to one another, which are indicative of cleaning. A dull luster could indicate the coin has been harshly dipped. An undamaged coin will exhibit luster which reflects in an hourglass shape. When the coin is rotated, the hourglass pattern will appear to spin; this phenomenon is known as ”cartwheeling," and is the ideal luster. Spotting good luster takes practice, and this is best learned under the tutelage of a more experienced numismatist. 3. Determine what you believe the grade to be, and use your grading book. In reality, if you ask five different people their opinion of the grade, you will get five different answers. The real question is what you think the grade is, which influences what you are willing to pay. There may be some occasions where you disagree with the dealer’s grade, and therefore the asking price. The key is whether the seller and the buyer can reach a consensus. Additionally, there are, unfortunately, some unscrupulous dealers in the coin market who intentionally "over grade," or assign a grade which is clearly higher than the coin’s actual grade, in an attempt to bilk an unsuspecting buyer out of their hard-earned money. This is why learning to grade is so important. 4. Check for problems. Things such as dings, contact marks, or corrosion can adversely affect the coin’s grade to the point where it cannot be graded as a problem-free coin. The Numismatic Guaranty Corporation (NGC), a respected independent third-party coin grading service, refers to these as "details” coins. Other companies have their own terms which denote the same thing. In other words, if a coin exhibits wear which would normally grade as a Fine-15 coin but has a substantial rim ding, the coin would be graded as ”Fine Details,” and command a much lower price than a problem-free coin. This is covered at length in the aforementioned ”Grading US. Coins Today” correspondence course offered by the ANA. 5. Check eye appeal. Although a coin may technically grade in a range acceptable to you and within your price range, there may be blotchy, dark toning or other factors which impair its eye appeal. A connoisseur would pass on this coin and continue looking for one that is attractive to the eye, despite the coin being at an acceptable grade and price for the buyer. 6. If a coin is encapsulated, or ”slabbed,” by a third party grading service, you can reasonably assume it is genuine. However, examine the photos for all the aspects discussed here and ensure you agree with the grade and/or variety attribution, and whether it has the eye appeal you are looking for. The saying goes, ”Buy the coin, not the slab." Remember, a third party grading service verifies a coin's authenticity and then assigns a grade based on wear. They can attribute varieties if the person submitting it for grading pays for this service, so it may be a variety which does not appear on the label. They do not assess eye appeal (see #5 above). Check a price guide or know the going rates for the coin you are buying. Remember, grade matters! All of these techniques are much more difficult to practice when buying online, but in today’s world, there is no escaping the convenience of finding that perfect coin through the power of the internet. However, there are some things about internet-based coin buying that collectors should be aware of. First and foremost, research the reputation of the seller. This should go without saying, but eager buyers continue to be ripped off by a few people who are eager to dump their cleaned and damaged junk onto the unsuspecting, despite having been called on it multiple times by former customers. Most auction sites have the ability to review sellers and to read other buyers’ reviews. Secondly, read and understand the seller’s return policy. If the coin in hand does not look like the coin in the photographs online, what can be done to rectify it? Will you get a full refund? Who pays shipping costs? Thirdly, closely examine the photos of the coin. Photos should be straight on, not at an angle. Some sellers hide hairlines (signs of cleaning) and other problems by shooting the photograph at a sharp angle, causing the light to reflect differently and the hairlines not to show. You could request a different photograph from the seller, or you could simply move on to the next coin. Fourthly, consider that many rare, or “key,” coins are being counterfeited in large numbers, mostly in China. It is a problem as old as money itself, and online auction sites are rife with counterfeits. Inexperienced numismatists can get excited over the cheap 1916-D mercury dime and think they’ve scored an auction win, only to send it off for grading and have it returned as a counterfeit. Therefore, as a rule, when buying key coins, only buy those certified and encapsulated by a reputable third party grader. Lastly, avoid online coin sellers who claim they do not know anything about the coin, or coins in general, or are merely settling an estate. As a rule of thumb, these people do know, in fact, something about coins and use ignorance to create a layer of plausible deniability for when their problem coins are discovered. While most people reading this have probably heard these bits of advice before, it never hurts to revisit the basics. Famous football coach Vince Lombardi used to begin each season by introducing himself to that year’s team of professionals by holding up a football and announcing, ”Gentlemen, this is a football.”5 Many were undoubtedly shocked or perhaps insulted that he would assert something so basic to a group of professionals. Lombardi's position, however, was that each season he began with the most basic elements of the game. Instill excellence In the fundamentals. He believed without mastering those fundamentals, his team could never hope to achieve greatness. In the same way, numismatists should master these fundamentals and periodically review them. John McFarland was born in Iowa where he began coin collecting for a Cub Scout project at the age of 8. Now in his forties, he is an avid numismatic hobbyist and considers himself a specialist in mercury dimes and other late 19th and early 20th century U.S. coins. He is a Lieutenant Colonel in the Army Reserves residing in Colorado Springs. As a civilian, he is an instructor for Space 300, the Air Force‘s top-level education for officers who work in the space operations career field. He has been an ANA member since 2010. 1 Sheldon, William. Penny Whimsy. New York: Sanford J. Durst, 1990. 2 Bressett, Kenneth and Q. David Bowers. Official ANA Grading Standards for United States Coins. Pelham, AL, Whitman Publishing, LLC, 2017. 3 Bowers, Q. David. Grading Coins by Photographs. Atlanta, GA, Whitman Publishing, LLC, 2008. 4 Ruddy, James F. Photograde: Official Grading Guide for United States Coins. Irvine, CA, Zyrus Press, Inc., 2005. 5 American Numismatic Association. Grading U.S. Coins Today: An ANA Correspondence Course. Colorado Springs, CO, ANA Florence Shook School of Numismatics, 2017. 5 Zelg, Eric. Gentlemen This Is a Football: Football’s Best Quotes and Quips. New York. Firefly Books. 2006.